While they're not medicated in any way, these DIY lemon ginger cough drops are simple to make, a little sweet, and the ginger and honey will help soothe a sore throat ever so slightly. Enjoy with a cup of tea, or in between mentholated cough drops and cough medicine if you need something stronger. 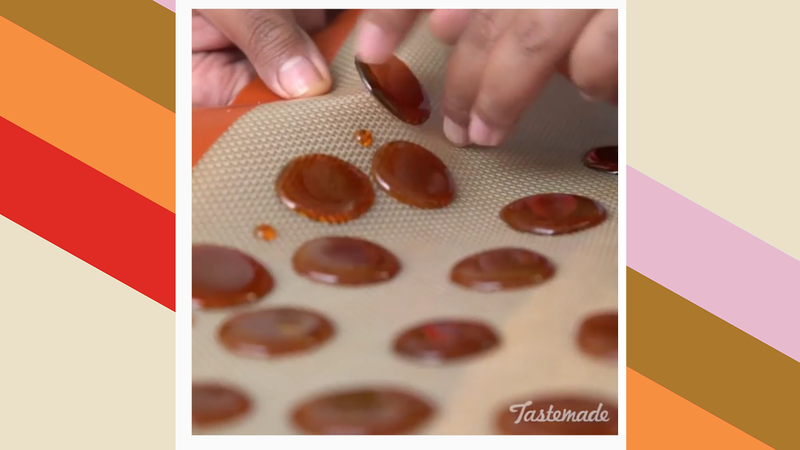 The whole recipe is on Tastemade's instagram (embedded above and linked below), so click through for everything, but you get the gist just by watching the video — you need plenty of honey, some freshly grated ginger, and the recipe calls for some mint extract as well. Mix everything up and let it simmer for a bit, then pour it into small coins on a silicone baking mat (or you could use parchment paper) to cool and solidify. Once they're solid, peel them off, wrap them individually, and pop one when your throat is on the scratchy side. Best of all, the inclusion of ginger means they could soothe an upset stomach too, so they're worth keeping around for that as well. Just keep them in an airtight container, and they will last for ages.